Around the turn of the 20th century, the Reverend Edward McClure, a Roman Catholic priest in Brockton, Massachusetts, commissioned photos of his house. 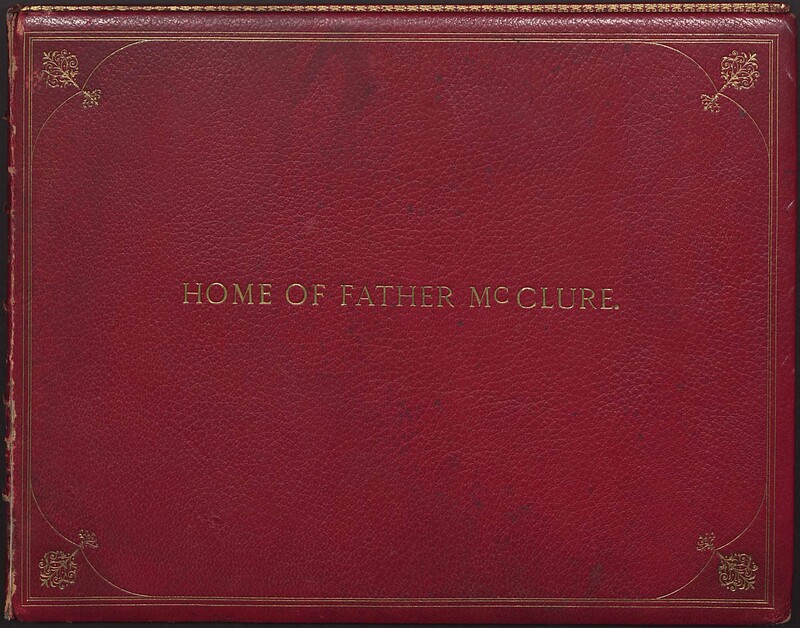 Lovingly bound in red morocco, the album cover proudly proclaims “Home of Father McClure” in gilt lettering. 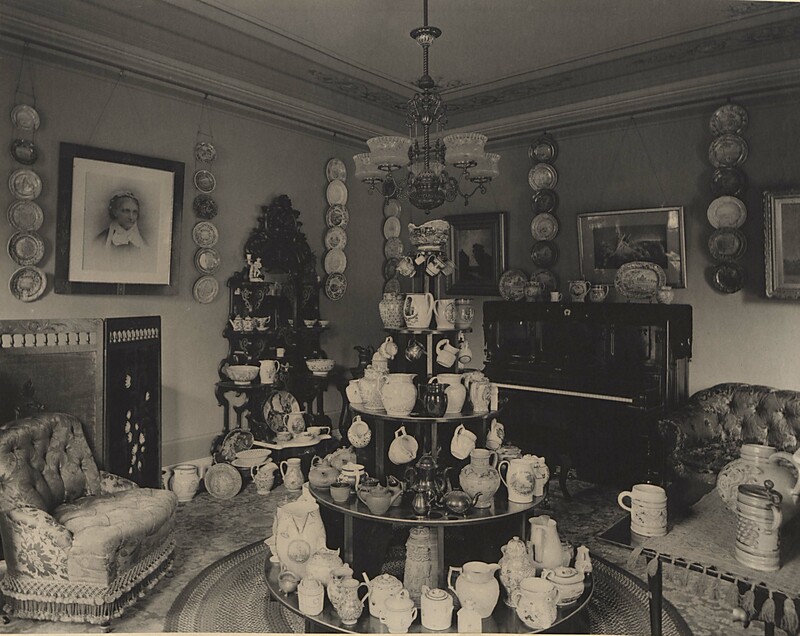 Upon opening the album, viewers are immediately struck by the overwhelming number of ceramics perched on furniture, hung on walls, and even deposited on floors in the house. After a photo tour of the rooms of the house, carefully arranged groupings of objects are featured, culminating in a photo of china-laden shelves. 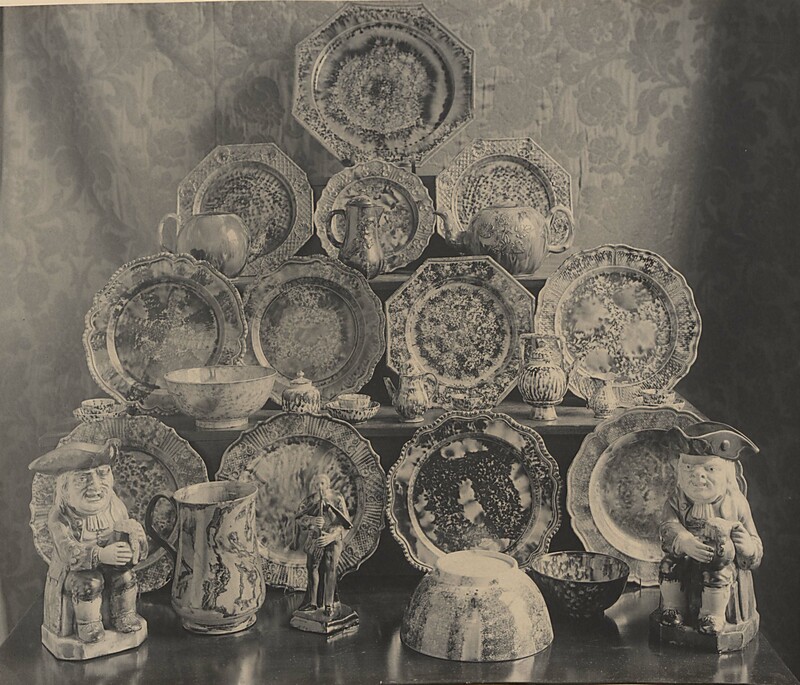 Father McClure’s collection of mostly 19th-century English objects included jugs, pitchers, plates, trays, tureens, cups, mugs, vases, bowls, teapots, and figurines. There were also some objects from other countries, dating back to the 17th and 18th centuries. Biographical information on McClure is fairly accessible, thanks in part to extensive coverage of his death in the local newspaper. He was born in Maumee City, Ohio, in 1844, ordained in 1871, and served in various parishes before his appointment to St. Patrick’s Church in Brockton in 1887. His 15-year tenure there was a very providential one for the parish as he settled its debt, renovated the church, and expanded its real estate holdings. His death in 1902 at the age of 58 from heart and kidney disease left an immense void in the community. Information on how McClure became interested in antiques is difficult to find, but the Brockton Times did comment on him being an “enthusiastic collector of bric-a-brac, rare pottery and valuable novelties” and valued his collection at $50,000 (nearly $1.4 million in today’s dollars). Since the album is so well preserved, I like to present it to visiting groups as a wonderful example of turn-of-the-20th century interiors (underneath all the ceramics). I always point the ceramics out and joke the priest must have had domestic help to dust them, otherwise he probably wouldn’t have collected so many pieces. To see if there was any truth to my joke, I recently searched ancestry.com and to my delight found one man and two women listed in McClure’s household in the 1900 census. The man, Timothy M. Woods, was most likely not responsible for housecleaning; he may have been performing building maintenance for the house and the church, chauffeuring, gardening, or similar duties. Woods may have also learned undertaking duties by the priest’s side since the 1910 census lists his occupation as that of undertaker, a profession he performed for over two decades. Another fascinating fact to be learned from census records is Woods’s marriage to McClure’s sister Mary E. McClure in 1909 or 1910. Less information was found on the two women, both Irish, named Hannah O’Dormer, age 37 in 1900, who immigrated in 1888, and Hannah McCarthy, age 25, who came over in 1895. Unfortunately, a cursory online search after 1900 yielded nothing as their names may have been misspelled on other documents or changed after marriages, but perhaps future searching will be fruitful as more records are shared online. I answered one question about who dusted all of the china, but will never know how the two Hannahs felt about cleaning around all those fragile pieces. This entry was posted in Academic Programs, antiques, Ceramics, Decorative Arts, Library, Uncategorized and tagged antiques, ceramics, library, religion, Winterthur, Winterthur Garden, Winterthur Museum Garden & Library. Bookmark the permalink.